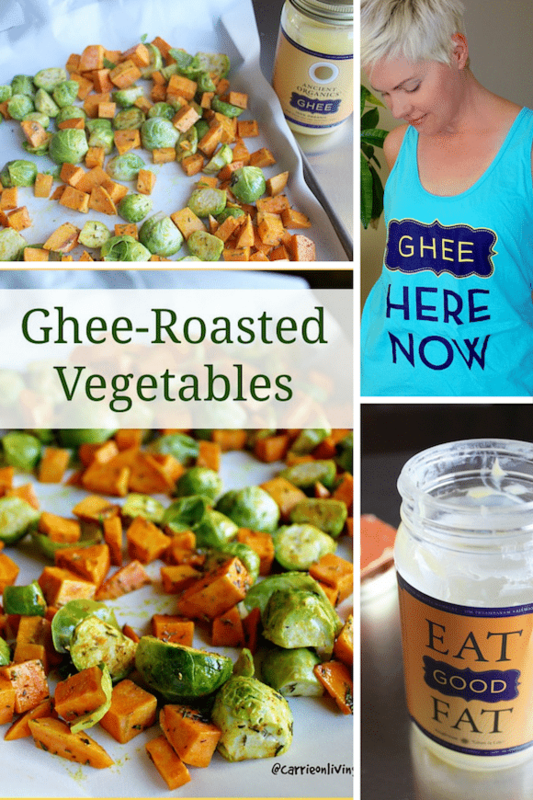 This post includes a recipe for ghee-roasted vegetables that are healthy and delicious. Most of the time, okay, pretty much all of the time, being a food blogger is the best hobby/job there is. Cooking, eating, connecting, being creative…eating! It doesn’t get much better than that. 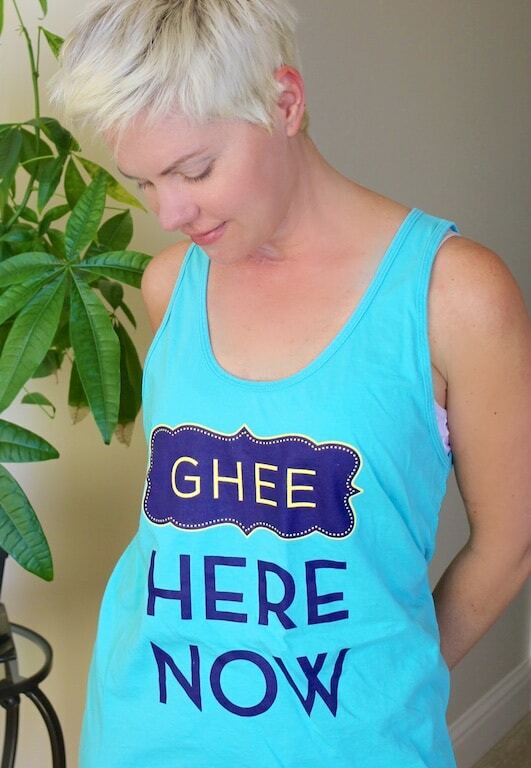 In case you aren’t familiar with ghee, it’s butter that has had the milk solids removed, so it’s usually okay for those who have dairy sensitivities, like me! The flavor is very buttery and delicious, and ghee is a staple in Indian cooking. 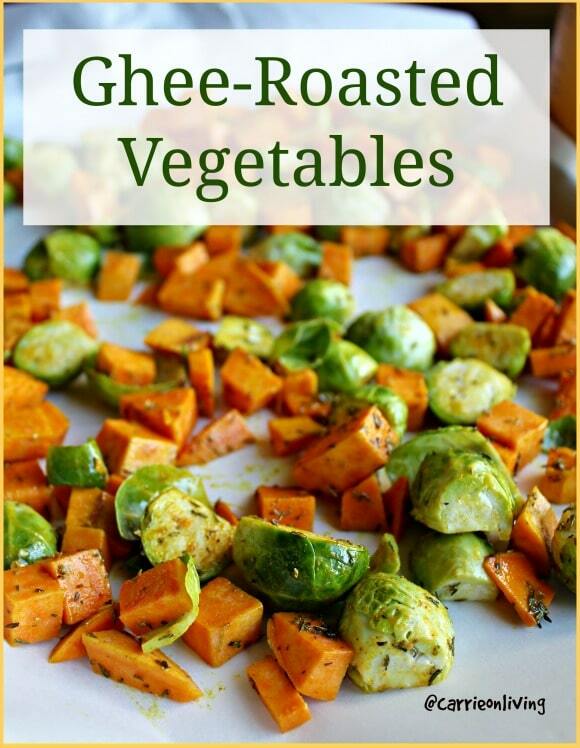 Ghee also has a very high smoke point which makes it appropriate for high temperature cooking, like the roasted veggie recipe I’m sharing below. 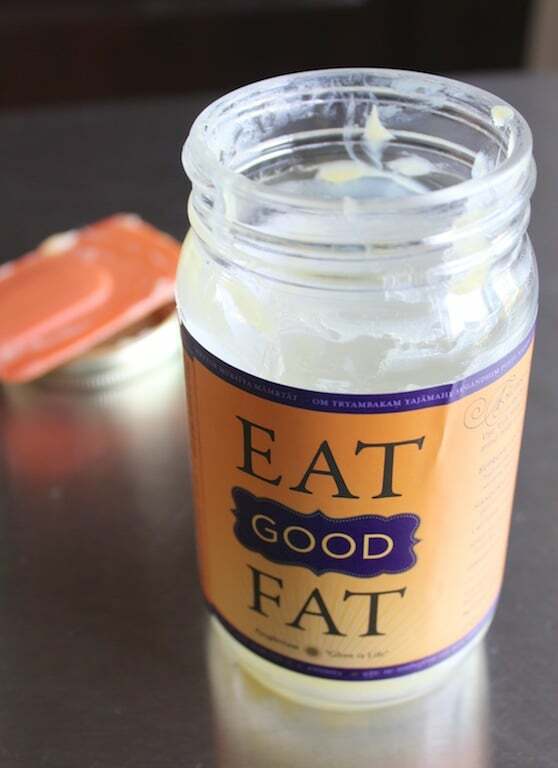 Ghee is, in fact, a “good” fat because it’s high in essential fatty acids and vitamins A, D, E, and K, not to mention being a great source of conjugated linoleic acid (I discussed this briefly in my Butter Coffee recipe post). Preheat oven to 375 degrees F. and line a baking sheet with parchment paper. 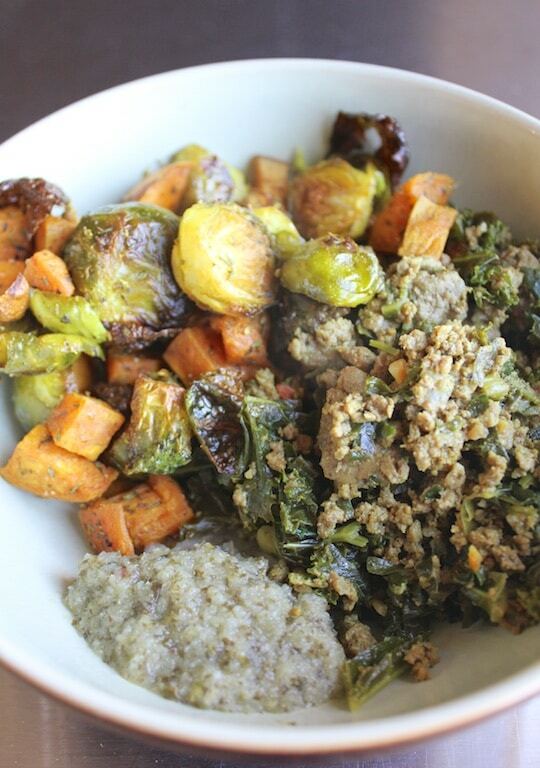 Place chopped vegetables in a medium bowl. 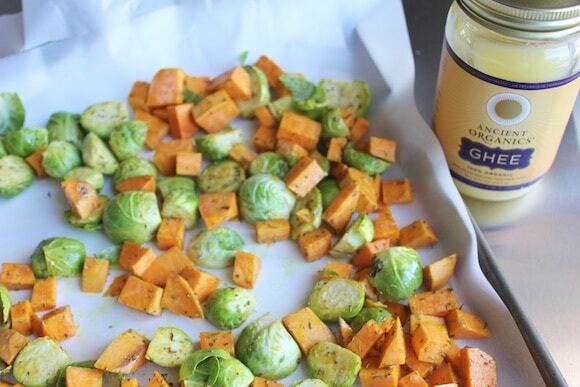 Melt ghee in the microwave or on the stovetop and pour over the vegetables. Sprinkle the turmeric and thyme over the mixture and use a spatula to stir together. 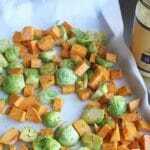 Pour the vegetables onto the baking sheet and cook for 30-40 minutes, or until vegetables are cooked, but not burned. Toss once during cooking. 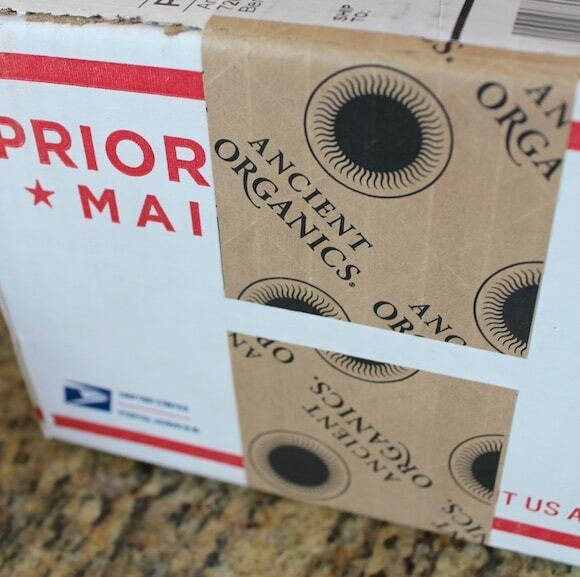 I’ve also added Ancient Organics ghee to my Amazon store as my product of choice. P.S. I also have a Carrie on Living Amazon affiliate store where I list all of my favorite beauty items, kitchen devices, books, and other cool stuff that supports my lifestyle. Your purchase of any item on Amazon helps support my blog so thank you in advance! Awesome, LMK what you think, Gina! I have also moved away from olive oil for roasting based on the worries about it oxidizing at high temps? Anyway, the ghee is perfect for that!!! Great, Gina! I’m so happy this was a success for you. I adore the flavor of ghee as well, it’s so buttery, without the problems of casein or lactose for those of us who are dairy-sensitive. Anywho, have a great weekend and thanks again for the feedback! XOXO. An interesting way to enjoy vegetables! I’m glad I saw your blog post. 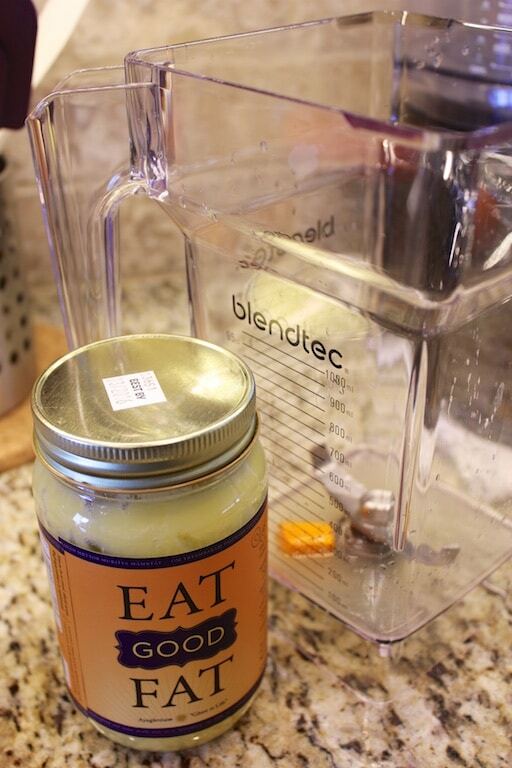 Thanks Carrie for sharing this great recipe!